After my busy and expensive week away last week, where I did 9 games in 7 days and must have spent about £500, I knew I had to be a bit more economical and sensible with my choices. Wycombe were down at Torquay, but that would mean a long journey and a costly one at that. My initial choice was Arlesey Town v Stourbridge, but that was called off due to Arlesey facing Leamington in the Southern League Cup. So I had a list of games, about 10 in all. After balancing it all up and discussing it with fellow traveller Anwar, we decided upon St Neots Town v Hemel Hempstead Town in the Southern League Premier Division. I had my usual day off on Tuesday and as I didn't have to leave home until just before 5, I was able to have a bit of free time. But I had a lot of catching up to do on my blog, having the latter part of 9 posts. I finished the last one, about my trip to Barton Old Boys about 4.55, which was about 10 minutes later than I had hoped. Nonetheless, I was glad to get it finished. I then had to rush off out, getting ever more expensive diesel at a local garage, before going to meet Anwar. I got to Aylesbury at 5.45 and we were soon on our way to St Neots. We made our way up cross country and into Milton Keynes and then across Cambridgeshire to St Neots. We arrived in the town just before 7 and both agreed that stopping off in town would be a good idea, even though we were pushed for time. I was glad of this, as there was a pub I wanted to visit, called the Pig n Falcon, which had 4 real ciders on, and was CAMRA Cider Pub Of The Year 2012 for Huntingdonshire. I had made a promise to myself to not drink during the week and eat better after last weeks excess, but what can I say, I am easily led astray, by no one else but myself! I had had 2 of the ciders on the list, with the other 2 unsure. So I opted for a half of the Skidbrooke Farmhouse Sweet and decided to leave the Olivers, the strongest of the 2, for another day, as time was not my friend, with kick-off fast approaching. Plus the fact that I had to drive to the ground of course. So I went in search of food and needing something quick, I got saveloy and chips for £2.85 and took it with me to the ground. We got to the ground just before 7.40 and went straight in, both getting a programme and settling under a shelter to eat our chips. The ground was really impressive and soon the teams were out and ready to kick off. There were a few players I recognised in the line ups. For the home side, defender Gavin Hoyte (though it later turned out he was not the former Arsenal player). 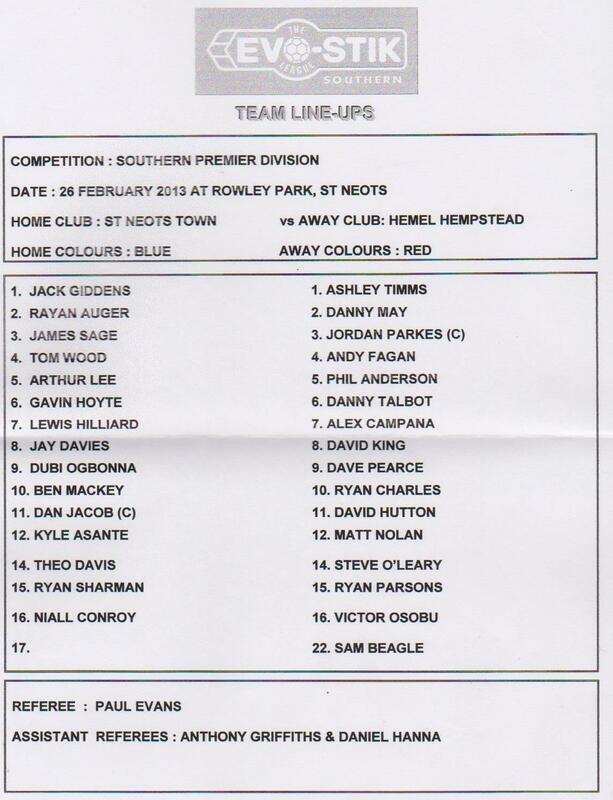 And for Hemel, former Wycombe youth team players Ryan Parsons and David Pearce. 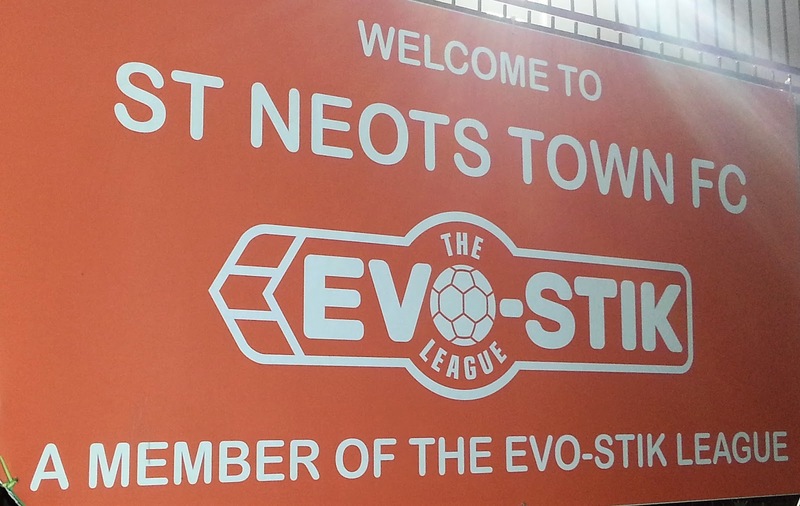 The first half was dominated by St Neots. But it was nearly half time before they took the lead - Dan Jacob scoring a great shot in off the bar. This sent the home side in 1-0 up at the interval. They continued to pressurise and grabbed their second through Dubi Ogbonna on 52 minutes, It was 3 just 4 minutes after Dan Jacob got his second and it looked like Hemel were going to get annihilated. Former Watford player Jordan Parkes had other ideas though. He showed the quality he got from being at bigger clubs earlier in his career as his long-range shot reduced the arrears on 75 minutes. Sadly for Hemel though, this was only a brief respite as 3 more goals, a 12-minute hat trick from Ben Mackie totally blew them away. The tannoy announcer had been playing individual music for each player's goals and amongst the hat trick hero's ones were the Big Ben chimes and Return of the Mack by Mark Morrison. So the game finished with a well-deserved thrashing for Hemel, which was a bit of a turn up for the books. 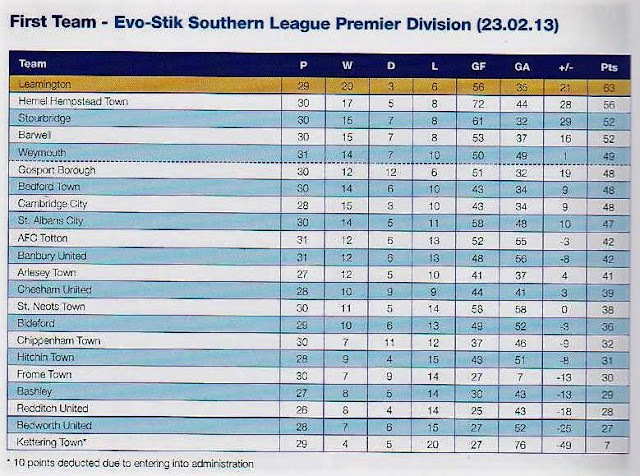 Despite a relegation battle last season, they were in 2nd place in the league at the start of the game. 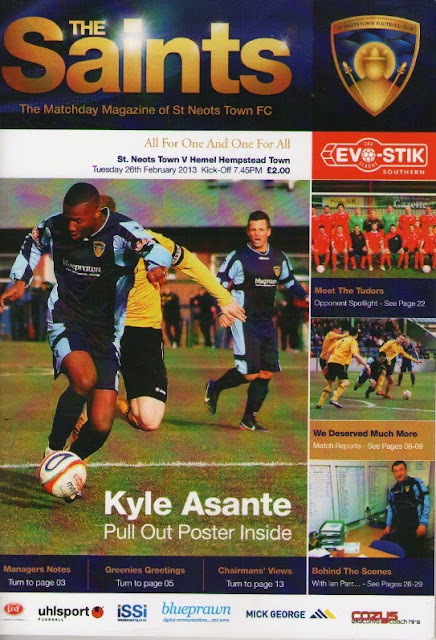 St Neots meanwhile, had been struggling for form in recent weeks and had slid down the table into 14th place. Despite this result, however, Hemel are firmly ensconced in the playoffs and it looks a tall order for St Neots to make up the gap. If they can play like they did tonight every game, anything is possible though. We left the ground at around 9.45 and put on BBC 3 Counties Radio to try and listen to a report of Wycombe's 2-1 win at Torquay. After going behind, Sam Wood and Matt McClure had turned the game on its head. 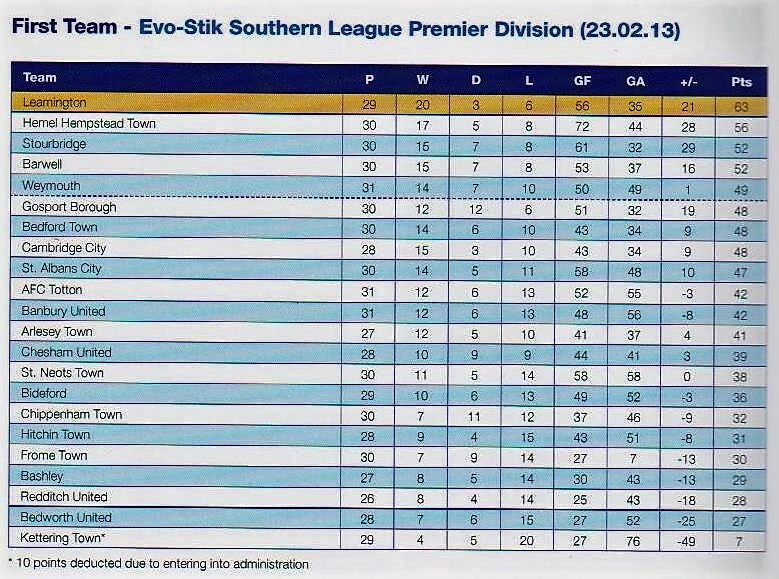 This put an end to Wycombe's recent bad run. But they didn't even mention our game, skipping from League 1 to the Blue Square Premier. In the 50 minutes that I listened, they spent about 30 minutes pontificating over Milton Keynes FC, about 12 minutes on Stevenage and about 8 minutes on their previous pet team, Luton, who had lost 2-0 at Braintree. No mention of Wycombe or any of the local non-league football teams that play in the area. I think that if they cannot do the job of covering local sport with any degree of competence, then the BBC should stop wasting licence payers money and shut the station down. After a fairly quick drive home compared to recent trips, I was back home by 11.10. But as with most other football nights, I was in no mood to go to sleep and only got to sleep just after 1am getting only a couple of hours sleep, meaning I was a bit drowsy the following afternoon. ROWLEY PARK is a smart and modern non-league ground, having been built in 2008. It replaced a nearby ground that was used for housing and in return, they got this one built. I'd say it was Blue Square South standard at least and could be OK for the Premier. There are 2 identical terraces at each end, both covered and holding around 1200 each. The only side without cover is basically hard standing and this houses the dugouts and scoreboard in the corner. The seated stand is very smart and has a capacity of 250. They may need to improve this aspect of it in the future to meet ground grading requirements, but for their current crowds, it is perfect. To the side of the stand is a nice bar, nothing amazing on the drinks range but it is big and has a massive screen as well as other TVs. I didn't try the tea bar. There is a small club shop, but it was closed on my visit. I enjoyed my visit here and would say that it ranks as one of the best days out in the Southern Premier. The town is about 15 minutes walk away and is well worth going there if you have time. Researching, 6 years to the day in 2019, there's a Wetherspoons called the Weeping Ash, plus two other decent looking places - The Ale Taster and The Pig & Falcon. Hi, thanks for visiting our ground and delivering such a good write up. However, a couple of points - Gavin Hoyte is not of Arsenal fame, that's another Hoyte altogether, and there is a club shop, well shed, but it wasn't open on the night you were there (it's the shed next to the players entrance onto the pitch. Thanks. A bit too late 6 years to the day, but noted and corrected whilst tidying up this entry.